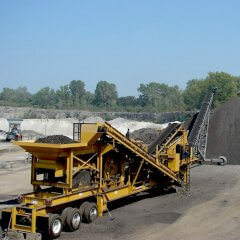 deck screen with reversible side transfer conveyors. A PT Tech HPT012 microprocessor-controlled hydraulic clutch promotes less power loss and more efficient fuel consumption while full plant operations are powered by a Cat engine with three extra outlets for auxiliary conveyors. Additional standard features include a large feed opening, discharge "rock box" with impact bed and hydraulic self-leveling system.